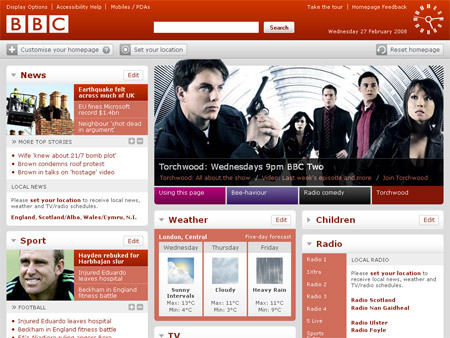 The BBC have for some time had one of the best websites on the Internet. It has a great simple design, was packed with regularly updated content and was very SEO friendly. No wonder they rank for so many terms and a have a Google PR of 9. Well today they launched a new look front page, one that is fully customisable using drag and drop technology. I’m drooling, and it’s nothing to do with the photo of Eve Myles from Torchwood on the main picture either (though she is helping slightly). I love this design. Absolutely love it.